Exercising for at least 150 minutes a week is one of the best things seniors can do for their health. Studies have shown that following a workout routine boosts the immune system, enhances cognitive health, and reduces the risk of many different diseases. 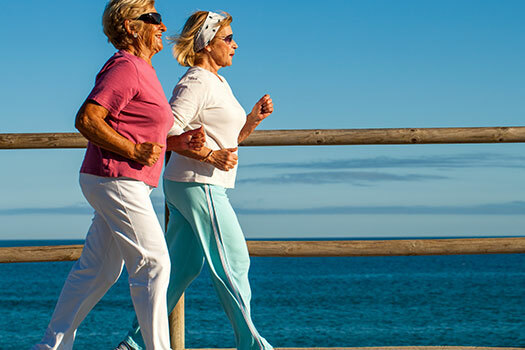 Here are some tips you can use to encourage your aging loved one to exercise. Following an exercise program can be difficult without a proper diet. A healthy and varied diet will give your loved one the energy he or she needs to jog, swim, or dance a few times a week. If your loved one is overweight or obese, speak with the doctor about tweaking your loved one’s diet to limit caloric intake. Exercising might not be possible until your loved one is within a healthy weight range. Once your loved one has stuck to the diet for a few weeks, he or she can start a beginner’s workout routine. Preparing healthy meals can be difficult for some seniors. If your aging loved one needs occasional help with bathing, grooming, cooking, or other basic household tasks, or if you need time to attend to important personal matters, reach out to Home Care Assistance, a leading provider of live-in and respite care. Clarksville seniors can maintain their independence while living at home with the help of our reliable respite caregivers. Instead of setting long-term goals that will take months to achieve, start off with easier goals that provide an immediate sense of accomplishment. Stretching a few days in a row, losing one pound a week, and walking for 10 minutes without a break are all simple goals most seniors should be able to achieve with a little bit of perseverance. After your loved one has reached those goals and grown more confident, speak with him or her about more challenging goals such as walking a 5K. Some seniors aren’t interested in exercising simply because it seems boring. Exercising alongside your loved one turns a workout into a social affair. Try out exercises and activities that can easily be carried out while holding a conversation, which might include walking around the block, tending to a garden, hiking on local trails, or following a stretching routine. If you aren’t able to exercise with your loved one, search for a local gym or community center that offers senior classes. Many older adults need help exercising. If your aging loved one needs help managing everyday tasks or encouragement to adopt healthier lifestyle choices, turn to Home Care Assistance, a leading provider of home care. Clarksville Home Care Assistance provides professional in-home caregivers around the clock to help seniors live longer, happier, and healthier lives. Exercising doesn’t produce immediate results, which is why you should always bring up any positive changes you notice in your loved one. Over the course of a few weeks, your loved one might begin to have more energy or seem like he or she is in a better mood. When you visit the doctor, ask if your loved one’s blood pressure or glucose levels have improved. All of these smaller benefits add up over time, and it is important to constantly emphasize them. Positive reinforcement is one of the best ways to keep an individual motivated. As soon as your loved one achieves a goal, plan some type of reward. Celebrating the achievements at the movies or a favorite restaurant may reinforce your loved one’s sense of accomplishment and push him or her even further. If your loved one needs encouragement to adopt a healthy lifestyle, consider hiring a professional caregiver. In Clarksville, home care agencies can be a great boon to seniors. With the help of the caregivers at Home Care Assistance, your aging loved one can lead a happier and healthier life. We offer a revolutionary program called the Balanced Care Method, which encourages seniors to eat nutritious foods, exercise and socialize regularly, and focus on other lifestyle factors that increase life expectancy. Call us today at (931) 444-1950 to create a customized care plan to suit your loved one’s needs.